►AWAKENING SUN is an international 4 piece modern death metal band from Lithuania and Holland. Since 2012 Awakening Sun did 7 tours, one of them was a 3 month European Tour which was an unforgettable experience for guys who were at that time only 18-22 years old. Awakening Sun already played more than 250 shows all over Europe and are ready to do US, Canada, and Asian tours in the near future. Right now the band finished working on their 3rd studio album which is going to be titled “INTO THE LIGHT” release of the album is planned for the 5th of March 2019! 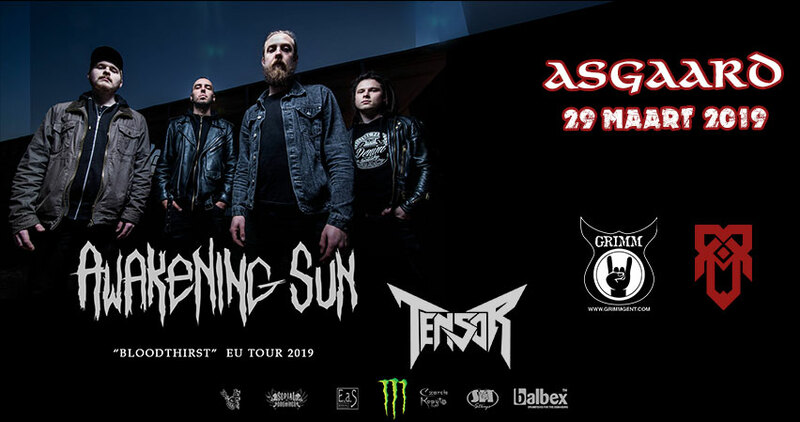 Awakening Sun shared the stage with bands like: Sepultura (main support in arena), Sabaton, HATE, Anaal Nathrakh, Alestorm, Combichrist and many more..! In 2016 band played at HELLFEST Open Air. They also won the T.Ė.T.Ė Award – “Best Lithuanian Metal band 2012”! ►TENSOR : 1 lady, 4 gentlemen, technically skilled in a wide range of musical styles, joined in their passion for metal. Featuring members of Herfst, The Advent of March, The Dirty Harries and Sanity’s Rage, one year after it’s inception, Tensor is about to record their first album and ready to hit the stage. Het is dus heel makkelijk om met de bus te komen en terug te keren naar Gent. Vanuit Gent kun je ook een taxi pakken, vanaf de Vlasmarkt is dit bijvoorbeeld ongeveer 8 euro. De parking van de Carrefour Oostakker oprijden (P+R Oostakker). Asgaard ligt dan aan de rechterkant. Er is meer dan genoeg gratis parkeerplaats en deze parking wordt niet afgesloten, waardoor je er vrij op- en af kunt rijden.